Are they dependable for teaching truth? From the readings of today’s liturgy we learn about the concrete way in which the Lord is with us. The Lord promises his disciples his Holy Spirit. The first reading tells us that the Holy Spirit will be “strength” for the disciples; the Gospel adds that he will guide us toward the fullness of truth. Jesus told his disciples everything, as he is the living word of God, and God can give no more than himself. In Jesus, God gave himself totally to us, that is, he gave us everything. In addition to this, or together with this, there can be no other revelation able to communicate something else, or to complete, in a certain sense, the revelation of Christ. In him, in the Son, we were told everything, we were given everything. But our ability to understand is limited; for this reason the mission of the Spirit consists in introducing the Church in an ever new way, from generation to generation, into the grandeur of the mystery of Christ. The Church does not present anything different or new next to Christ; there is no pneumatic revelation next to that of Christ, as some believe, there is no second level of revelation. No: “He will take what is mine,” says Christ in the Gospel (John 16:14). And, just like Christ, he [the pope] only says what he hears and receives from the Father; the Holy Spirit is Christ’s interpreter. “He will take what is mine.” He does not lead us to other places, away from Christ, but makes us penetrate ever more within the light of Christ. For this reason, Christian revelation is, at the same time, always old and always new. For this reason, everything has always and already been given to us. At the same time, in the inexhaustible encounter with the Lord, encounter mediated by the Holy Spirit, every generation always learns something new. Thus, the Holy Spirit is the force through which Christ makes us experience his closeness. But the first reading also leaves a second message: you will be my witnesses. The risen Christ is in need of witnesses who have encountered him, who have known him intimately through the force of the Holy Spirit, men who, having touched Him with their hand, so to speak, can attest to him. It was in this way that the Church, family of Christ, grew from “Jerusalem … to the ends of the earth,” as the reading says. The Church was built by witnesses, beginning with Peter and Paul, the twelve, all men and women who, full of Christ, in the course of the centuries have rekindled and will kindle again in an ever new way the flame of faith. Every Christian, in his way, can and must be a witness of the risen Lord…. But this symphony of witnesses is gifted with a clearly defined structure: to the successors of the apostles, namely, the bishops, corresponds the public responsibility to make this network of witnesses endure with the passing of time. In the sacrament of episcopal ordination [Holy Orders] they are conferred the necessary authority and grace to exercise this service. In this network of witnesses, a special task corresponds to the Successor of Peter. Peter expressed in the first place, in the name of the apostles, the profession of faith: “Your are the Christ, the Son of the living God” (Matthew 16:16). This is the task of all the Successors of Peter: to be the leader in the profession of faith in Christ, the Son of the living God. The chair of Rome is, first of all, chair of this creed. 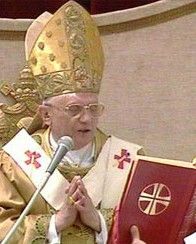 From the loftiness of this chair, the Bishop of Rome is obliged to repeat constantly: “Dominus Iesus.” “Jesus is Lord,” as Paul wrote in his Letters to the Romans (10:9), and to the Corinthians (1 Corinthians 12:3). To the Corinthians he said, with particular emphasis: “For although there may be so-called gods in heaven or on earth … yet for us there is one God, the Father … and one Lord, Jesus Christ, through whom are all things and through whom we exist” (1 Corinthians 8:5). The chair of Peter obliges its incumbents to say, as Peter did at a moment of crisis of the disciples, when many wished to go away: “Lord, to whom shall we go? You have the words of eternal life; and we have believed, and have come to know, that you are the Holy One of God” (John 6:68 and following). Whoever sits on the chair of Peter must remember the words that the Lord said to Simon Peter in the Last Supper: “And when you have returned again, strengthen your brethren” (Luke 22:32). The holder of the Petrine ministry must be conscious of being a frail and weak man, as his own strength is frail and weak, constantly needing purification and conversion. But he can also be conscious that from the Lord he receives strength to confirm his brethren in the faith and to keep them united in the confession of Christ, crucified and risen…. The Bishop of Rome sits on his chair to give testimony of Christ. Thus the chair is the symbol of the “potestas docendi,” that teaching authority that is an essential part of the mandate to bind and to loose conferred by the Lord to Peter and, after him, to the twelve. In the Church, Sacred Scripture, whose comprehension grows under the inspiration of the Holy Spirit, and the ministry of authentic interpretation, conferred to the apostles, belong mutually to one another in an indissoluble way. 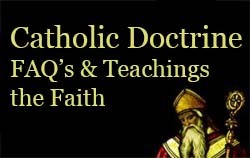 Whenever Sacred Scripture is removed from the living voice of the Church, it becomes a victim of the experts’ disputes…. This teaching authority frightens many men within and outside the Church. They wonder if it is not a threat to freedom of conscience, if it is not a presumption that is opposed to freedom of thought. It is not so. The power conferred by Christ on Peter and his Successors is, in an absolute sense, a mandate to serve. The teaching authority, in the Church, entails a commitment to service of the obedience of the faith. The Pope is not an absolute monarch, whose thought and will are law. On the contrary, the Pope’s ministry is guarantee of obedience to Christ and his word. The Pope must not proclaim his own ideas, but bind himself constantly and bind the Church to obedience to the Word of God, in face of attempts to adapt and water down, in face, as well, of all opportunism…. The chair is — let us say it once again — symbol of the teaching authority, which is an authority of obedience and service, so that the Word of God — his truth! — may shine among us, indicating the way to us.